How to improve the foam in your next glass of homebrew. Are you an extract brewer who needs help making hoppier homebrew? Find out what factors influence hop bitterness and what you need to do to reach your target IBUs. Also, identify the beer styles you can successfully brew givenyour homebrew equipment and procedures. How to get your beer from here to there without the air. 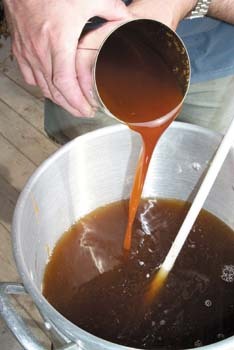 Learn different ways to move wort or beer in your home brewery. Get your homebrew fires burning with one (or more) of our 10 things to try to expand your brewing horizons. Extract brewing is not just a simplified form of all-grain brewing. It’s a process that has its own set of challenges. Find out what these challenges are — and how to master them — without changing your whole brewing setup or spending a lot of extra time on brewday. Thanksgiving is just around the corner and many brewers may want to brew a special holiday beer. Coincidentally, several ingredients found in typical Thanksgiving dishes can be used for making beer. Let our recipes for pumpkin old ale, cranberry zinger ale and sweet potato ESB grace your table this year. Not every yeast strain is available at your local homebrew shop. For some, you need to hit the bottle. Everything you need to know about how to round-up yeast from a bottle-conditioned beer. What’s really important when it comes to improving your brewing skills and what don’t you need to worry about as much? Find out. How are we celebrating our 10th anniversary? By brewing a 10% ABV Imperial American Stout with 10 grains and 10 hop additions, that’s how. A homebrew judge (and contestant) tells you how to go for the gold and make your homebrew submission stand out in its flight at the contest. They’re here. They’re there. They’re everywhere — those ubiquitous light lagers like Heineken, Grolsch and Becks in their green bottles. Learn how to brew one at home (and learn a few new techniques — including cereal mashing and high-gravity brewing — while you’re at it). Plus: the skunk factor.